Been gaming the same Nippon 130x shafts for several years now. Really enjoy them and feel they’re a really good fit. Now I feel this is fine in my gap wedge but have felt that maybe it’s time to move away from them in my 56/60. I have a strong digger swing but find sometimes that it’s harder the flight my wedges. Am I right to think because of the shaft being so firm and unable to load it properly for easier swings that it may be a cause for the feeling that I only hit moon balls? Been thinking of possibly switching to like a Nippon 115 wedge shaft. My main concern though is going to far in the opposite direction and having too soft of a shaft I guess. If you are truly a fit for 130x nippons I would not play the 115s, completely different profile. Play the 130 s in your lower wedges. And being overly stiff wouldn’t cause moon balls, the opposite actually. I play 130 s flex and play tour v wedge flex in my wedges, another good alternative. Generally speaking, I would also guess that the 130 s is a better match. However, anything can feel better for a particular person so it's hard to say. For the SW/LW (mainly partial swing wedges), it seems like the shaft is mostly feel and has less to do with the actual flex/loading. For example, I think Koepka plays X100 / S400 (typical pattern). Following the same logic, I would play R-flex / Senior-Flex (or SS R-flex). 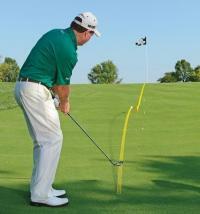 But to make a 60* wedge go 50 yards, we are both probably swing the club at about the same speed. For him it just happens to be a flick and for me it is like a 3/4 swing. For whatever its worth, I've played a LW with anything from an R-flex 6 iron shaft to a X100 in it. They definitely feel different but I don't think they impact the shots much. I would say I am for sure. That's a good point though. 130s would probably be a lot better. I guess I really only wanted the 115 wedge because they come in black now and TM has them as an option for wedges. Nippon 125 wedge or Dynamic Gold s400. Are they different bend profiles compared to the 130? Yes. But they will both be heavier, lower launch, smoother, and a touch softer than the 130. Exactly what most people typically find attractive in a wedge shaft design. A slightly softer flex will allow you to get ample spin on partial shots (big mission for SW and LW) while maintaining a tempo swing.